FOR over 300 years Andrews Flour mill has been successfully supplying the traditional food and baking sector. Rising from humble beginnings, originally operating from the family mill in Comber, the business has spanned the centuries and is now the only independent company based in Belfast in Northern Ireland solely focused on flour and milling an extensive high quality range of flours. Andrews Flour has been milling for the bakery sector in Northern ireland for 300 years. To improve brand awareness of the local flour milling leader and position of the company for future growth, Andrews Flour undertook a business growth programme consisting of website re-development and package re-design. From their base on Percy Street in Belfast, they now mill a wide range of premium quality flours for use in both the household and commercial bakery. With 290 years of experience, the advantage of combining traditional skills with modern milling technology, and exceptional knowledge of what the local customer requires has established Andrew’s Flour as a market leader. A key part of its progressive strategy is the packaging re-design of the popular Ormo Flour range for the home baker and smaller craft bakeries. This includes Ormo Plain, Self Raising and Soda Bread Flour, all available in 1.5kgs. packets. With that, Andrews Flour aims to improve the customers’ shopping experience, resonate the quality and excellence of the brand and maximise display visibility across the supermarkets in Northern Ireland. 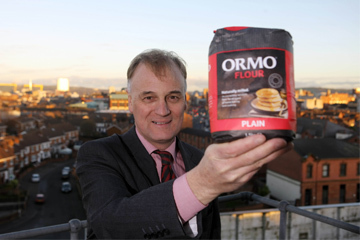 Both Ormo Bread and Flour have an iconic image in Ulster and all home bakers know Ormo Flour can be relied on to give outstanding baking performance. 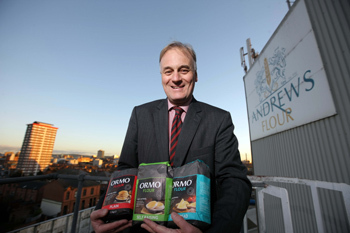 Therefore, to conserve the supreme quality and taste of Belfast’s favourites – Ormo Soda and Wheaten Bread – Andrews Flour continues to supply the finest flour. To leverage the company’s profile and increase public awareness, Andrews Flour also transformed their website. Michael Taylor of Andrews Flour with his different products. “Professor Lester Manley and his team in Manleys, the branding house based in Belfast, helped us renovate and align the website with our brand and values wrapping it in visual, modern, friendly and wholesome web-design. On the website you can also learn more about the history and key accomplishments, of Northern Ireland’s oldest flour mill”. The lessons learned from the Andrews Flour case show that it is not only important to be brand aware, but to to be proactive in its development to maintain your place in the market. Manleys is the branding house based In Belfast, which has been providing branding, innovation, strategy and marketing communications services to companies across UK, Ireland, Europe and the UK. With over 25 years of experience, Manleys has been transforming brands and customers experiences which results in increased long-term competitive advantage for their clients.